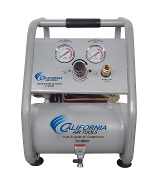 The California Air Tools Light & Quiet1P1060SP Portable Air Compressor is designed to be one of the quietest air compressors in the industry having only 56 decibels of sound. The .6 HP motor operates at only 1680 RPM creating less noise and less wear. The New "IP" Ultra Quiet & Oil-Free Motor is a Large Single Piston Pump design is engineered for high performance and durability. The 1.0 Gallon Steel Air Tank is Lightweight (34 lbs) making it very easy to transport. The 1P1060SP Air Compressor has a Oil-Free Single Piston pump designed to have a life cycle before wear of 3000 Plus hours compared to other comparable air compressors with life cycles of 250 hours or less. The easy to see and read control panel makes using this air compressor even more user friendly. The 1P1060SP produces 1.2 CFM @ 90 PSI allowing you to use staple guns, brad nail guns, finish nail guns, nail guns, airbrushes and blow guns. This air compressor is great for the garage and perfect for cleaning and inflating tires, beds, toys and sport balls. This air compressor is ideal for anyone working inside where noise is a major issue.